Discover a framework for crafting your personal brand and finding the story you want to tell, both online and offline. Last week, we looked at why managing your personal brand – both online and offline – is so critical to the success of your business. We revealed that you have a personal brand whether you know it or not; that it’s your choice as to whether you decide to do something about it; and that there is immense power in allowing your potential clients to get to know you so that they trust you and open up to what you have to offer. The obvious next question is: okay, so how do you do that? 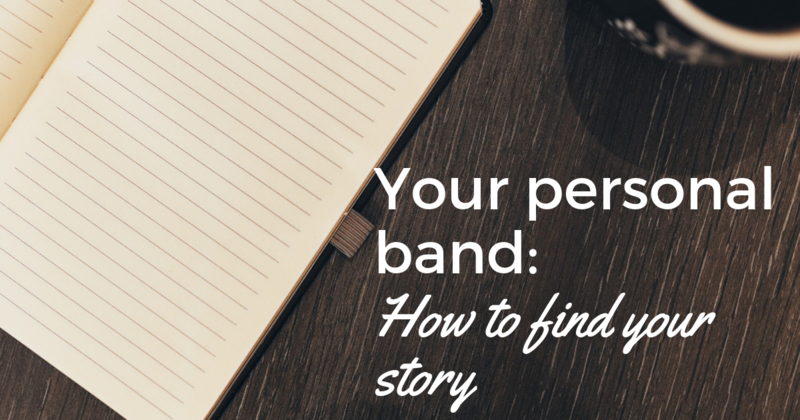 And the answer is that it starts with getting clear on who you are and what you stand for – essentially, finding the story you want to tell (or, more accurately, you want to be told about you). Before you start telling your story, you need to know what that story will be! You may have come across Simon Sinek and his 2009 TED talk, How great leaders inspire action. He develops a simple model of “WHY – HOW – WHAT” and argues that it’s so much more powerful to “start with why” when it comes to your business. Most companies will start with what they do – for example, a computer manufacturer might say, “we sell really good computers” – but the ones that are really winning start with the why – for example, Apple says, “We believe in thinking different, in challenging the status quo.” Communicating that bigger vision of why you do what you do attracts people who believe in that vision and is much more likely to get you loyal fans than just a good product. It’s the same thing when it comes to your personal brand. It’s all very well to talk about how you do consulting for this, or you help people do that, or you sell these various things. But why do you do what you do? Why should people care? Ask yourself: What is your overall purpose, your big “why”? Why do you get up in the morning and go to work? What is it that you’re ultimately trying to achieve? You may have a very clear idea of why you started your business – because you wanted the freedom to make your own decisions and the flexibility to spend more time with your family, for example – but in order to get other people to care, you’ll need to think about the bigger picture. What is it that you want to help clients ultimately achieve? What´s the impact that you want to have in the world? Call it your ‘purpose’, your ‘mission statement’, or your ‘why’ – but you need to have a clear idea of your reason for running your own business (and it can’t be “to make money, baby”!). Brands are more and more value driven today. As with the business purpose, communicating clear values will attract customers who share those values. Your personal brand, because it’s by definition personal to you, needs to be even more closely linked to your own values. What do you want to stand for? What do you value most of all in your personal and your professional life? How is that different to what other people stand for and prioritise? Your values will guide your personal and business decisions and help you make “strategic trade-offs” between different choices along the way. You can’t be everything to everyone, so clarifying your values will help you with decisions such as whether your messaging should be supportive, down to earth and conversational – or rebellious, challenging, and even a little provocative; whether the look and feel of what you put out needs to be beautiful and luxurious, or real and raw; whether you’re going to work with big corporations regardless of their attitude to the environment, or you’ll only work with ethical and sustainable businesses. Try to come up with three to five core values. What qualities can you own and really embed in everything you do? What attitudes and beliefs do you bring to your work and the way you live your life, consistently and without fail? These values should be meaningful and also actionable. It needs to be clear what each of the values means for how you run your business and work with your clients. Of course you value ‘integrity’, ‘honesty’, ‘good customer service’ – otherwise, you shouldn’t be in business! – so try not to be generic and don’t try to be “noble” for the sake of it. Another important part of your personal brand is your skillset. What are the hard and soft skills that you bring to the table? What are your unique strengths? Hard skills are taught, quantifiable skills that you have probably learned through school, training and your work experience. They are also often specific to a particular job or task. For example, hard skills can include bookkeeping, SEO marketing or foreign languages. Soft skills are less easy to measure and can be more subjective – these are your interpersonal skills, the kind of thing you’ll often hear in job interviews. For example, “good communication skills”, “strong time management”, or “being a great team player”. Finally, you have your personal strengths or character traits, things that come naturally to you and that remain more or less constant throughout your different experiences. True empathy, although you can work on it to some extent, is something that some people can feel very naturally and easily as they understand and relate to other people. Don’t get caught up in the semantics of these distinctions, just use them as a guide to make sure you consider all aspects. This is where your personal brand begins to flow into your business brand, especially when you are running a service-based business where the business is you. The mistake I see people make here is that they focus on the immediate and almost superficial result that people will get from working with you. To exaggerate the point, a copywriter might say that they help clients write great copy; a virtual assistant helps people with their admin; and a personal trainer will say that they help clients with their training and fitness. Does a company care about having great copy? Maybe some do, but most care more about what that copy will do for them: attract more people to the brand, convert more prospects into clients and, ultimately, grow the business and make them more money. Yes, a virtual assistant may help with accurate bookkeeping and efficient email management; but, really, the entrepreneur you’re working with cares more about the peace of mind that this will give them, and the time and space they’ll gain to focus on the important things in the business. And someone who comes to a personal trainer doesn’t just want help with their training and nutrition; but they might want to lose weight, look better and feel more confident. Finally, you’ll want to consider the evidence you have to support all these impressive claims you’re making, from your mission to your values and your skills and strengths. What awards and accolades do you have? What qualifications and certifications? Make a list of all of your degrees, awards, credentials, prominent media appearances and key examples of your work. But don’t limit yourself to those formal titles and publications, which may or may not be relevant to your client. How else can you convey your value to people? Testimonials from previous clients, for example, are a great way to do this, and it will be much more convincing to hear about who you are and what you do from those clients than from your own mouth! Rather than telling people that you’re a good public speaker, can you share video clips and feedback from your past audiences? As a writer, how can you demonstrate your skill in your writing? Collecting this evidence will both build your confidence in your brand and your value and communicate that value convincingly to your prospective clients. Right, so you have the elements of a personal brand story: you know why you’re in business and why you do what you do; you have a clear set of values, which are meaningful to you and to your day-to-day work; you’ve mapped out your particular set of skills and strengths; and you have the means to back it all up. However, you may still feel a little “icky” around the idea of building your personal brand and pushing your message. Next week, we´ll look at dealing with that “ick” factor as you get more comfortable with selling… well, yourself, basically! If you can’t wait to learn more about the ins and outs of building your personal brand and you just want someone to help you get started NOW, then I have something for you! I’m pleased to announce a new set of services that I’ll be launching as part of the support I want to provide you as you’re setting up your business. Sometimes, you don’t ‘just’ want coaching, you want someone to do the actual work! These ‘done-for-you’ services will give you the tangible support you need when you’re first starting out in order to build a personal brand with credibility and authority in your target market. And the first service I’m launching is your customised about page! Looking to share your story with the world, establish your authority and attract your ideal clients? A well-written about page can do all that, bringing to life your unique personality and style while increasing your value perception among your target market.